When two intrepid friends can't agree on where to go, they set off on their own. But both realize exploring together would be more fun. Friends Garcia and Colette can't agree on where to go exploring. Garcia's determined to go outer space but Colette is certain the ocean would be much better, so they decide to head out on their own. 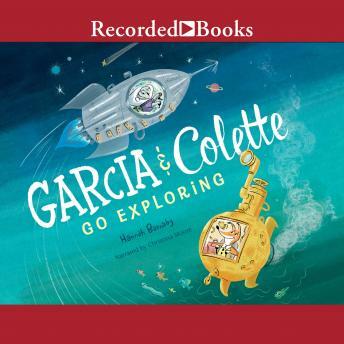 Garcia builds a rocket while Colette builds a submarine. They each pack their gear and a lot of sandwiches and embark on their journeys. But when they arrive in space and deep under the sea, they realize both places are lonely without a friend. Luckily, when they get home, they find a compromise-a place full of stars and sand that they can enjoy together. Author bio: Hannah Barnaby has worked as a children's book editor, a bookseller, and a teacher of writing for children and young adults. She holds an MA in children's literature from Simmons College and an MFA in writing for children and young adults from Vermont College. Her first novel, Wonder Show, was a William C. Morris YA Debut Award nominee. She lives in Charlottesville, VA.